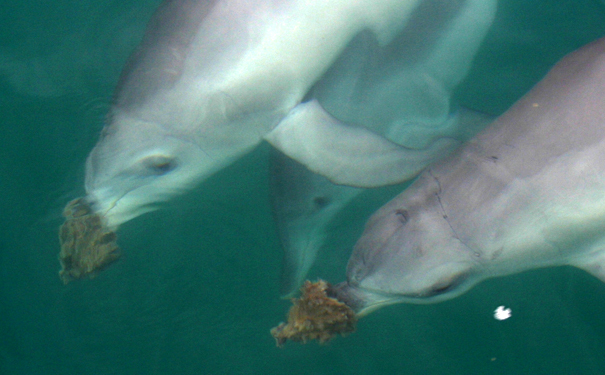 Bottlenose dolphins display the first evidence of animal grouping based on mutual interests. Defining social groups that are formed during adolescence is not restricted to high-school students. Researchers have discovered recently that bottlenose dolphins associate with one another based on cultural practices, thus demonstrating the first definitive example of subculture in animals. Animal tool use is related to intelligence, innovation and cultural behaviour. Scientists at Georgetown University, in the US, investigated for more than 20 years the behaviour of bottlenose dolphins in Shark Bay, Western Australia. They wanted to assess if the bottlenose dolphins that use marine sponges as hunting tools (spongers) are culturally distinct from other dolphins in the population. ‘Spongers’ obtain and wear basket sponges — filter feeding invertebrates — on their beaks while scouring the seafloor for prey. According to the researchers, female spongers associate more with each other than with non-sponge users. The results were surprising to the researchers, as Mann suggests that the sponge-wielding dolphins are solitary for most part of their lives. “At first it seemed like the spongers weren’t interested in a social life,” she says. Two main methods were used in conducting the research. First, the scientists identified the dolphins and gathered data about their customs (they collected more than 17,000 surveys). Second, they followed individuals for a few hours at a time and recorded the dolphins systematically. “We have a catalog with over 1,500 dolphins that we have identified and tracked in the eastern gulf of Shark Bay,” says Mann. In other animal populations, individuals develop a behaviour because they are part of a group, as opposed to grouping because of a behaviour, explained the researchers in a paper published recently in the journal Nature Communications. Since sponging is a solitary behaviour, affiliation among spongers is not based on collective foraging, but on identifying other individuals as spongers. “These patterns are remarkable because spongers lead a relatively solitary lifestyle and have weaker ties with other dolphins than non-spongers do,” wrote the researchers. Previous Post Lucid dreaming and the neural basis of consciousness Next Post How do astronauts sleep in space?